We live in a rather nondescript house, not very old, not terribly charming on the outside. (I love the inside.) As I sorted through my photos from our trip, I wondered if I had taken enough of windows to do a post for Five on Friday. Uh, yeah. Definitely. These are just a few, from France. There are many more, and perhaps I'll do another post on English or Welsh windows. These windows illustrate individuality to me. Shutters can be painted in one's favorite shade, and plants act as frames. Monet's dining room window, above, is lush with colour and texture. Another window in Giverny shows simplicity and charm with the gingham curtains that match the colour of the shutters. Blue and white is my all time first choice colour combination. In contrast, this stark photo of the abbey at Jumièges shows abandonment and devastation, and yet the pure lines of the window and wall speak eloquently of the architect's aesthetic. Bright red shutters that match the roses growing nearby made for a striking look in Arromanches. The Abbey of Saint-Wandrille is a working monastery. In the photo on the right, can you see the figure of a small fox? The man who patiently carved the intricate stone for the pillar beside the window left his mark centuries ago. "I was here." "I created this." It's a statement of individuality. 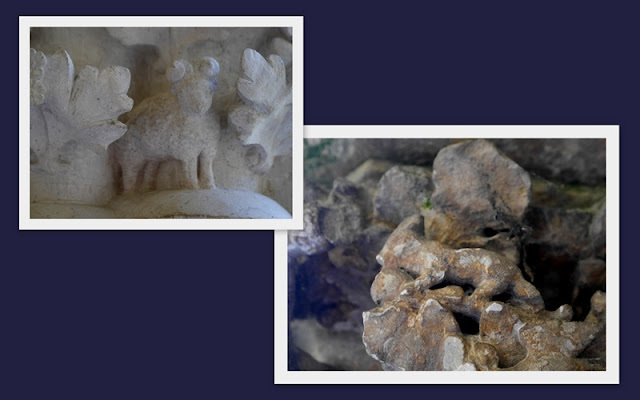 In the top left photo, a ram serves as signature of the stoneworker who is helping to replace some of the windows in the cloister. She, for stone work is not restricted to men anymore, chose this symbol from the story of Abraham and Isaac on the mountain; the ram caught in the thickets. We all display our individuality in unique ways. It might be via words or gardens, music or cooking, kindness or sports - these are our windows to the world. Linking to Amy's Five on Friday post. This will be the last until September. Such variety in windows, and your camera captures the variations on a them beautifully. Thanks. Great post with good commentary. I'm always gazing upon windows and grabbing my camera. Your blue and white one especially oozes charm. Have a great weekend--you will probably enjoy being at home! Windows and doors - they make such lovely collections, especially when they are from far away where life is a little different. I enjoyed the variety! I love seeing how others adorn their windows. These are all so lovely to me. I'm looking forward to seeing more photos of your trip, Lorrie. What an amazing post, it was wonderful to see the beautiful windows. What beautiful windows, so colourful. I'll be looking forward to more windows, and doors if you have them! The blue window is my favourite and I think shutters add cottage charm. Lovely post. I like looking at windows and doors. You are right about the personality showing. Have a great week. I have a weakness for beautiful architectural structures, which includes windows. I love all your window photos. So very wonderful!!!! Lovely windows and thoughts. Enjoy the warm weekend! I immediately recognized Monet's window - didn't you just love that beautiful house and garden? Like Mary I too recognised the window from Monet's home and when I saw the red shutters my first thought was "that's a Normandy window"! Lovely post, Lorrie, bon weekend. I miss having shutters. Apart from being practical, they also give individuality to a home. Thanks for sharing. Happy weekend! I like the first and second windows, they look so romantic ! What a beautiful post, Lorrie...like the colorful doors of Ireland, these windows speak to me, too. I wish my current home would lend itself to shutters. The HOA would probably have a fit, though, especially since I'm busy fighting with them to have a tree removed that is blocking my view of the pond & fountains. Grrrrr! I found your post to be very calming...I needed that. Yes please to the idea of more window posts. How pretty and unique each of these is. My personal favorite is the second one. To my eye that is just perfect. Such beautiful windows! I love Monet's house with the pink of the wall and pink rose in contrast to the shutters. What wonderful windows, thanks for sharing them. We have shutters, but they look so dull in comparison. Have a good start to August! Just finished catching up on your travelogue. It was fun touring France, England, and Wales vicariously through you. Thank you for the armchair travel, Lori!